Nashville, long known more as a mecca for Country Music than a development hotspot, is enjoying a downtown resurgence. Projects like Music City Center and the redevelopment of the Tennessee capital’s convention center are forging a new urban character for Nashville. The latest example is a new office tower that will stand among the city’s tallest buildings. 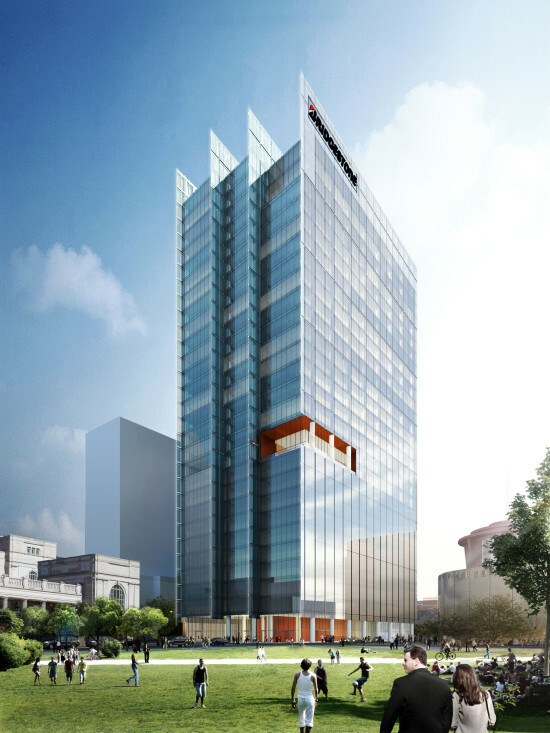 Work began last week on the $232.6 million, Perkins + Will–designed headquarters for Bridgestone Americas. The tire company is one of the largest private employers in downtown Nashville. Their move from existing offices near the airport brings 1,700 employees—600 of whom currently work out of state at facilities in Bloomingdale, Illinois, and Carmel, Indiana—into downtown Nashville’s SoBro district. Named for its location south of Broadway, SoBro has seen rapid development in recent years, including tvsdesign’s Music City Center—a 2.1-million-square-foot convention center with a wavy roof meant to evoke the rolling hills of Tennessee. The transaction is contingent on $50 million in Metro incentives and an undisclosed package from the state that, according to sources familiar with the deal, is comparable to the city’s commitment. At 30 stories the new tower would be among the city’s tallest buildings. The last office tower built in Nashville was the Pinnacle at Symphony Center—a 29-story, LEED Gold building designed by Pickard Chilton and Everton Oglesby Architects that opened in 2010. Due in mid-to-late 2017, the new 514,000 square foot building will feature four parallel planes reaching up from a sleek, glassy facade.